Our volume controls add convenience and cool factor to your whole house system. 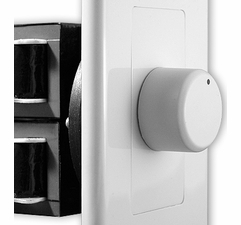 Available in simple knob control or soft-touch sliders, these clever devices can match the style and décor of any room. There are two basic typesof volume controls: transformer and resistor based. 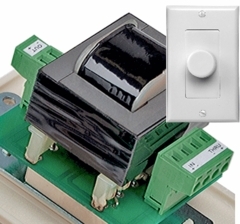 Most are the transformer type, which can be purchased with impedance-matching or without impedance matching. Impedance matching is far more popular because installers and do-it-yourselfers use impedance-matching volume controls when they design a multi-speaker system with two-channel stereo output. If you have only one pair of speakers (both inwall or outdoor), use the non-impedance matching volume controls, which provide excellent sound. For multiple pairs of speakers, choose the impedance matching volume controls. Always connect them in parallel and one volume control can control one pair (left channel + right channel) speakers. Set the jumper switch of the impedance volume controls according to the pairs of speakers that you are connecting. A well-designed whole house audio system includes indoor and outdoor volume control. 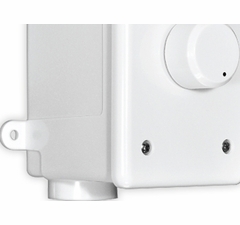 These wall-mount devices can be located in any room where you have speakers and allow you to control speaker levels independently in each zone or room. Connect multiple pairs of speakers to the same speaker volume control, or each pair to its own unit, while maintaining a safe impedance level for your receiver or amp. Attractive decora styling adds elegance to any interior, and we offer knob control or soft-touch sliders in a variety of custom colors. We also make weather-resistant outdoor speaker volume controls, 70v units for commercial applications, and even tabletop models.